This last weekend (11-13 September 2015) Kings Place exploded with a whole variety of events for the annual Kings Place Festival, and event where many of the events are free. There was a very wide variety on offer from world music to classical, family events to spoken word. 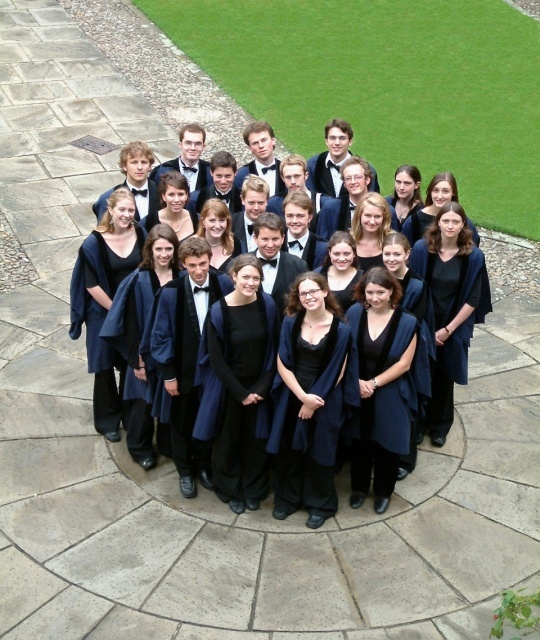 I went along on Saturday 12 September 2015 to an event which somewhat mixed contemporary classical with hints of world music when Dr Geoffrey Webber and the Choir of Gonville and Caius College, Cambridge performed the programme of contemporary Brazilian choral music, Romaria which included music by Carlos A Pinto Fonseca, Almeido Prado, Nibaldo Araneda, Aylton Escobar, Osvaldo Lacerda, Ernst Mahle and Villa Lobos. Much of the repertoire from the concert is from the choir's recent CD (see my review), but this is the sort of repertoire which benefits immensely by being heard live. In his spoken introduction Dr Geoffrey Webber explained that he had been interested in the lively 20th and 21st century choral scene in Brazil for some time, but the nature of the music publishing in the country meant that it was difficult to get copies of the music. A chance academic encounter led to contacts with the University of Sao Paolo and to tonight's concert. The choir is a 24 strong mixed voice choir, with the singers being drawn from the student body. Their regular repertoire includes services in the chapel, but Dr Webber and the choir have something of reputation for exploring unusual musical byways; another of their recent discs explored the music of the early Celtic church (see my review). They opened with Jubiaba by Carlos A. Pinto Fonseca whose text describes a ceremony in an indigenous religion derived from that of the African slaves. There was a clear dramatic outline to the music, but this combined with a strong rhythmic sense and a feel of Latin-American popular music all leading to a fabulous orgiastic accelerando at the end.. By complete contrast, Oraculo is a work from the 1950's by Almeido Prado who studied in Darmstadt with Ligeti. The text is taken from Virgil's Eclogues and the setting combined some atmospheric tone-clusters with a more traditional melodic writing, the result having an interesting spice to it. Ismalia by Nibaldo Araneda was the most recent work on the programme, dating from 2009. It sets a text by Alphonsus de Mulmaraens (1870-1921) about Ismalia going mad. The music combined six-part choir (Ismalia) with soprano soli (the sky) and tenor solo (the sea), it also used multiple keys. Elegiac in tone, much was soloists over wordless chorus but developing into complex choral texture which became dense and intense. All in all a very striking piece. Aylton Escobar's Missa breve sob ritmos populares brasileiros uses popular Brazilian influences in creating the mass. The choir sang the Gloria and Sanctus from the mass. The two movements were both an amazing mix of melodic vocal writing with the rhythms and street sounds of Brazil. Highly episodic in structure, it was very appealing and certainly a piece of virtuoso solo singing. The Benedictus was more romantic in style and used four soloists accompanied by rhythmic, wordless choir. Osvaldo Lacerda's Romaria sets a poem by Carlos Durmmond de Andrade (1902-87) about the culture around pilgrimages in Brazil. It is a slightly curious piece as it combines quite simple, elegant choral episodes with spoken sections (here the recorded voice of Professor Marco Antonio da Silva Ramos from the University of Sao Paolo). In fact Professor da Silva Ramos' recitation was highly musical and the sound of the spoken Brazilian Portuguese language completely fascinating. Henrique de Curitiba was a Polish composer who settled in Brazil and took a Brazilian name. His Metaphors is for six solo voices and tape. The solo voices sang an Et Incarnatus est by Victoria, repeating it five times, initially Victoria's music is performed straight but each repetition gets more complex and De Curitiba's treatment of the original more contemporary, the first soprano was given some truly spectacular lines (superbly sung here). The whole is complemented by a background tape of the Brazilian rain forest, which prefixes and overlays the music. On when hearing the work on the choir's recent recording, the various layers tended to merge but heard live there was a clear difference between the two and the sounds of the Brazilian rainforest complemented and concentrated the live music in a strange way. Carimbo is Ernst Mahle's Suite of Folksongs from the State of Para. The choir sang five movements, attractively melodic and catchy tunes in quite straightforward arrangements. The final movement, Vamo acab co'este samba (Let's end this samba) depicted the glorious chaos of an illegal samba party. Finally, a piece by the best known Brazilian composer, Villa Lobos. The choir were joined by pianist Liam Crangle (who had previous sung counter-tenor) to perform Villa Lobos' arrangement of Caboca of Caxango which combined popular rhythms and melodies in fine style, using the choir to back a group of soloists. The whole really put a smile on the face and got the feet tapping. Dr Geoffrey Webber introduced each item in the programme, giving us some of the background, and there was a fascinating contrast between his informed, direct, rather academic delivery and the explosion of music on the stage. The programme took the singers through an enormous range of styles, all of which they mastered superbly under Webber's confident direction. Not only were the choir's performances impressively accurate in such a wide variety of genres, but it was clear too that they were having fun so that works like Ernst Mahle's Carimbo simply exploded with joy.